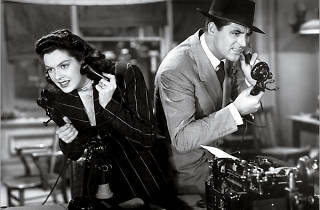 Perhaps the funniest, certainly the fastest talkie comedy ever made, this inspired adaptation of Hecht and MacArthur's The Front Page adds an extra dimension of exploitation by turning Hildy Johnson into Walter Burns' ex-wife. Grant's Burns performs astonishing feats of super-quick timing as he garrulously manipulates a gallows case - Qualen, a simpleton mercilessly jailed for killing a black policeman - to further his own ends: first, to win back his wife from staid insurance salesman Bellamy (wonderfully slow in gumboots and bovine smile); second, to win back his star reporter (Hildy again); and third, to beat the rival rags to the full story of the political corruption that casts a shadow over the judicial system demanding Qualen's death. 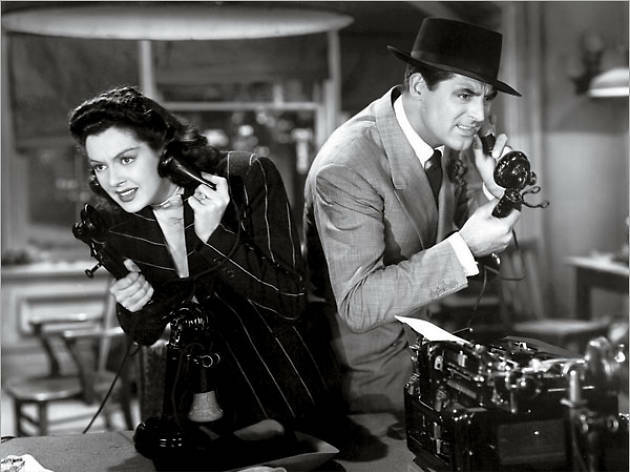 But Grant is not alone in his masterly expertise: Charles Lederer's frantic script needs to be heard at least a dozen times for all the gags to be caught; Russell's Hildy more than equals Burns in cunning and speed; and Hawks transcends the piece's stage origins effortlessly, framing with brilliance, conducting numerous conversations simultaneously, and even allowing the film's political and emotional thrust to remain upfront alongside the laughs. Quite simply a masterpiece.